James Oleinik, Principal PM Manager, 6 сентября 2017 г. The newest update for PowerApps (version 690) launches a preview of the 'Usage' report for app authors to review the usage of their apps across their organization and the ability to use a delimiter to break a text string into parts with the Split function. The App usage report gives app authors the ability to track how many users have launched your app over the past 30 days broken down by day, device platform and location. 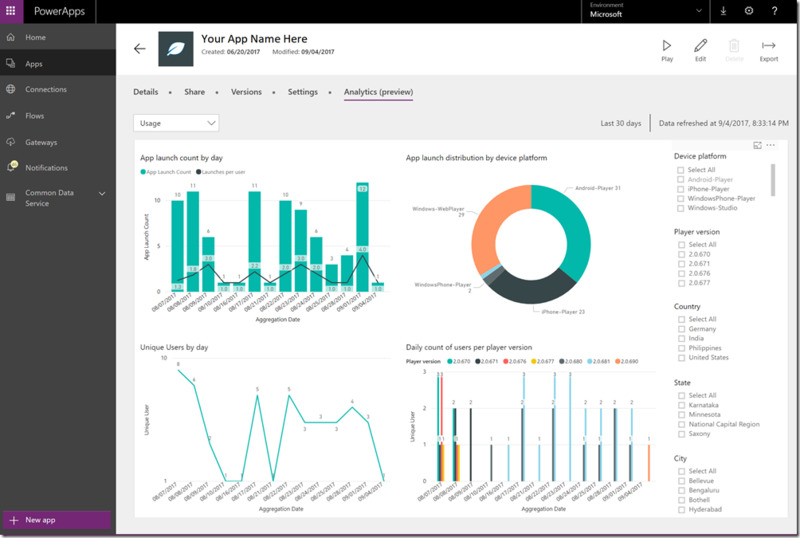 If you are interested in learning more, check out my blog post that outlines the capabilities of the report and where you can find it on web.powerapps.com. Got a list of fruit to buy at the market? “Apples, Oranges, Bananas”? Need a way to quickly and easily break that string up so that you can check them off, one by one? Both of these methods result in the desired single column table [ “Apples”, “Oranges”, “Bananas” ].